Life has had a long time to potentially get a foothold on the rocky planets circling the tiny, dim star TRAPPIST-1, a new study suggests. TRAPPIST-1 and its seven roughly Earth-size planets are between 5.4 billion and 9.8 billion years old, according to the new study. For comparison, Earth's solar system is a shade under 4.6 billion years old. TRAPPIST-1, a star just 8 percent as massive as the sun, lies about 40 light-years away from Earth. Earlier this year, astronomers announced that TRAPPIST-1 hosts seven rocky planets, three of which appear to lie in the "habitable zone" — the range of distances from a star where liquid water could theoretically exist on a world's surface. A maximum age of 9.8 billion years may sound ancient, but TRAPPIST-1 is really just getting started: It and other dwarf stars can keep shining for trillions of years. "Stars much more massive than the sun consume their fuel quickly, brightening over millions of years and exploding as supernovae," study co-author Eric Mamajek, deputy program scientist for NASA's Exoplanet Exploration Program at NASA's Jet Propulsion Laboratory (JPL) in Pasadena, California, said in the same statement. "But TRAPPIST-1 is like a slow-burning candle that will shine for about 900 times longer than the current age of the universe." In case you were wondering, the sun won't burn through its hydrogen fuel for another 5 billion years or so. At that point, Earth's star will expand into an enormous red giant before ultimately collapsing into an ultra-dense stellar corpse known as a white dwarf. TRAPPIST-1 is an ultra-cool dwarf star in the constellation Aquarius, and its seven planets orbit very close to it. 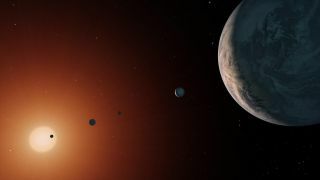 Though three TRAPPIST-1 planets are in the habitable zone, it's unclear if any of them can actually support life as we know it, scientists stress. For example, these alien worlds all orbit so close to their host star that they're tidally locked, always showing the same face to TRAPPIST-1. These planets therefore all have "day sides" and "night sides," which may be blistering-hot and freezing-cold, respectively. Thick atmospheres would distribute heat around the TRAPPIST-1 planets, potentially making them more livable. But astronomers don't know if these worlds have any air left all; their atmospheres may have been stripped by radiation from their nearby host star long ago. The new study contributes to the ongoing assessment of TRAPPIST-1 and its potential habitability, but it doesn't tip the scales one way or the other, scientists said. "These new results provide useful context for future observations of the TRAPPIST-1 planets, which could give us great insight into how planetary atmospheres form and evolve, and persist or not," JPL exoplanet scientist Tiffany Kataria, who was not involved in the study, said in the same statement. Such future observations may include measurements by NASA's Hubble Space Telescope and the agency's upcoming James Webb Space Telescope, researchers said. This work could help astronomers determine if the TRAPPPIST-1 planets have atmospheres (and characterize these atmospheres, if they exist).